So a little background. Management and I spent the first 19 years together in a very small home. This smallness made hosting big family dinners (her dream) at our house impossible. So when we moved to a larger home a little over a year ago, she jumped at the chance to host big family dinners any chance she gets. To seat all of these (15-20 people) I cobbled together a 12ft table from 2x and plywood. It gets the job done, but is a PIA to take apart, put together and store. That single use table has now seen two Thanksgivings and at least a half dozen other functions. I’m afraid that if I don’t do something soon, that this piece of crap will reach heirloom status and I will be stuck lugging it around for the rest of my days. So tables it is. Table design has been on my mind since we moved. (Management has made sure of it…LOL). Once I read “The Anarchist’s Design Book“, I knew what the basic design would be. 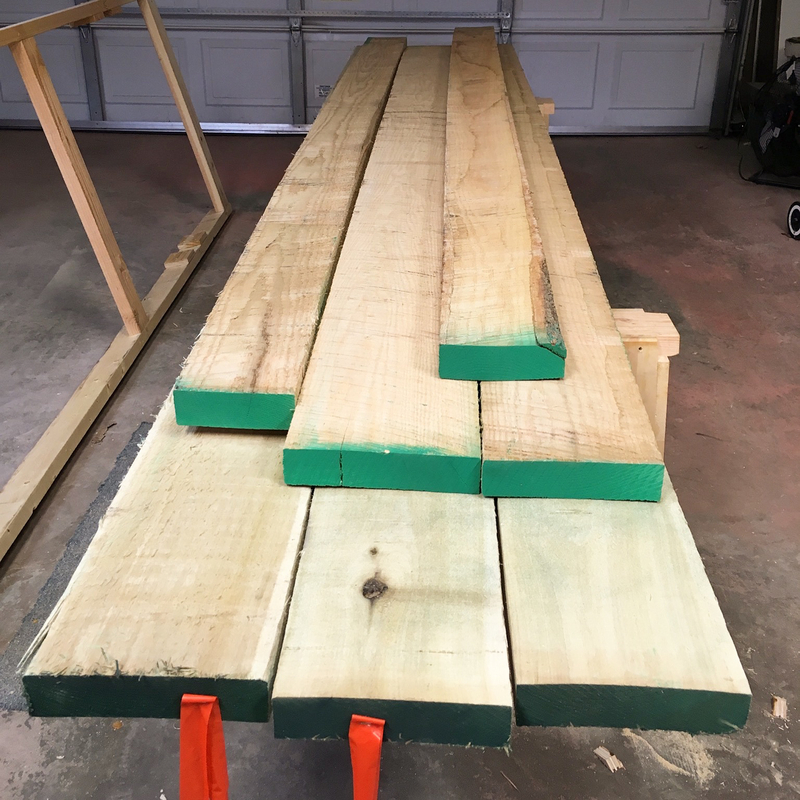 Sourcing material was a challenge for me, but just before Thanksgiving this year I found a lumber yard and picked up enough oak and poplar to get me started. With the material piled up in the garage, I needed to nail down the design. Yes, I could have used CW’s design out of the book, but I just cant help myself. Besides, I work in proportions. After a little work at the drawing board I had a working drawing. I finally got started by crosscutting the bits that I needed to rough length. I set the poplar aside and milled the oak into leg stock. I first surfaced and squared two adjoining faces and then ran the oak thru my old portable table saw. 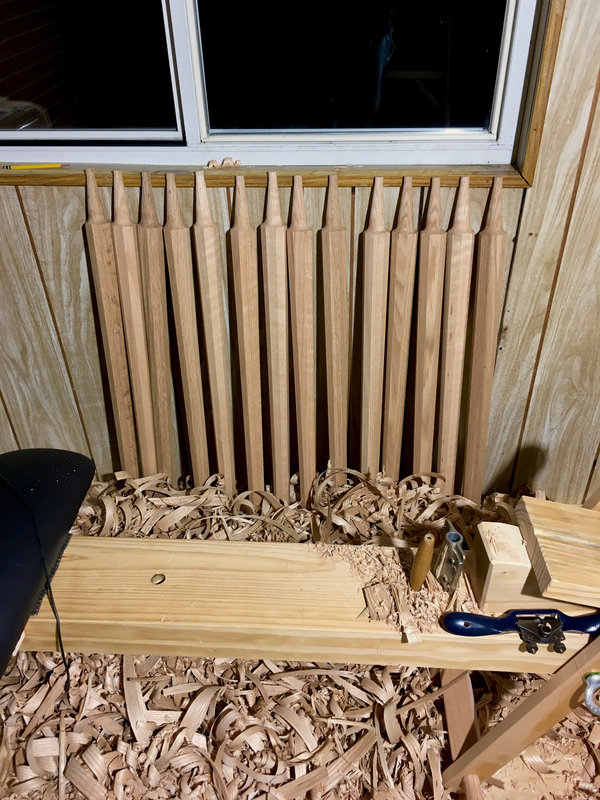 I did have sense enough to install a new blade and tune up the old saw before all of this, so the milling went smoothly, messy (no dust collection), but smoothly. I then laid out the legs using my new purpose built gauge. I spent the past several days working on the legs. 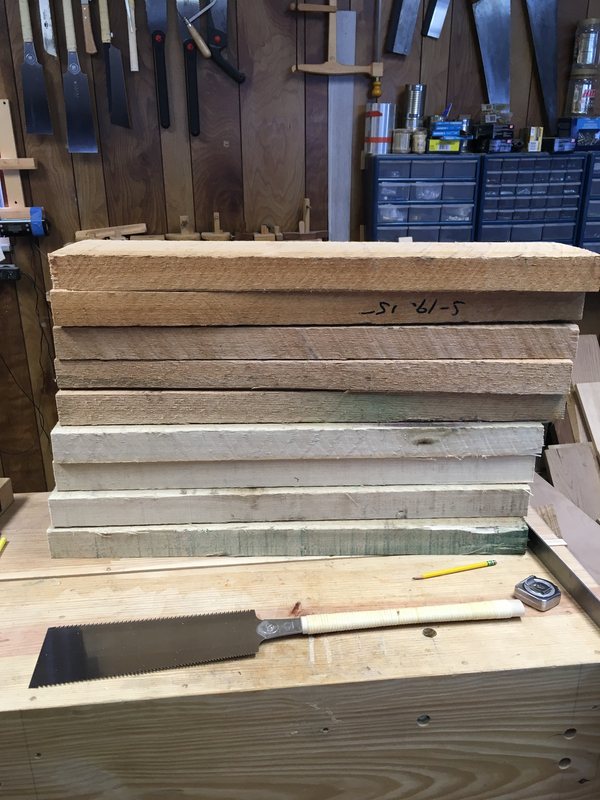 I roughed out all of the tapered octagons and their tenons. 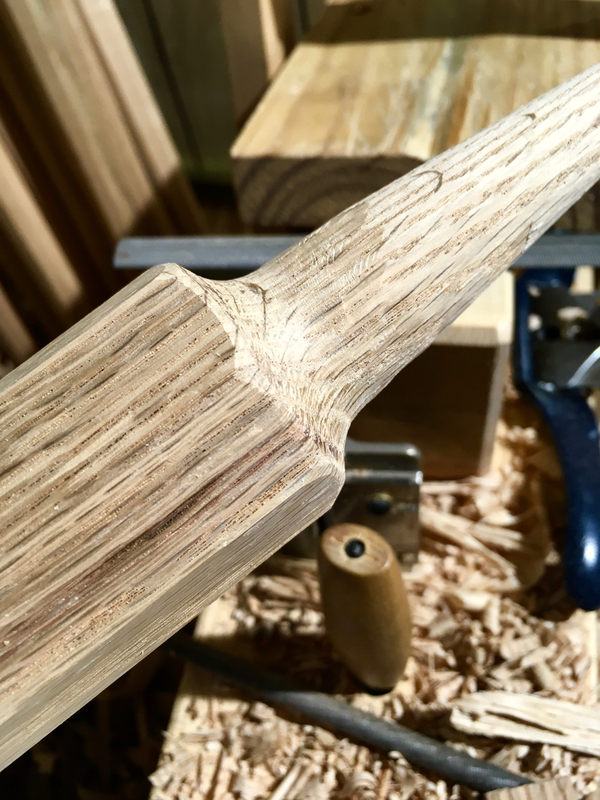 Cleaned them up with a plane and refined the transition from leg to tenon. 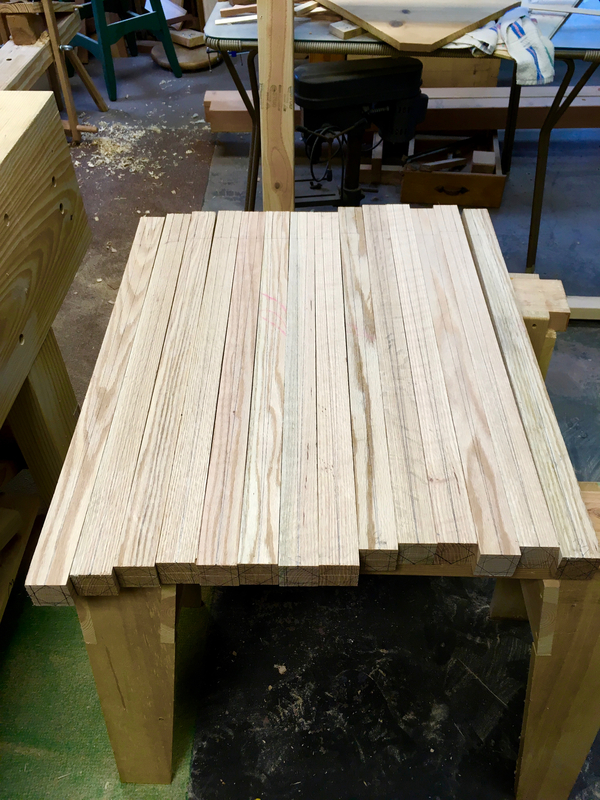 These are relatively thick legs and I wanted a cove transition from full-width to the base of the tenon. Creating this cove on a lathe would take a matter of seconds, without a lathe it took a little bit longer. I hogged most of the waste away working the drawknife with the bevel down for control. I followed this with some carving knife work and finished with a half-round file. Next I’ll tackle the poplar tops. 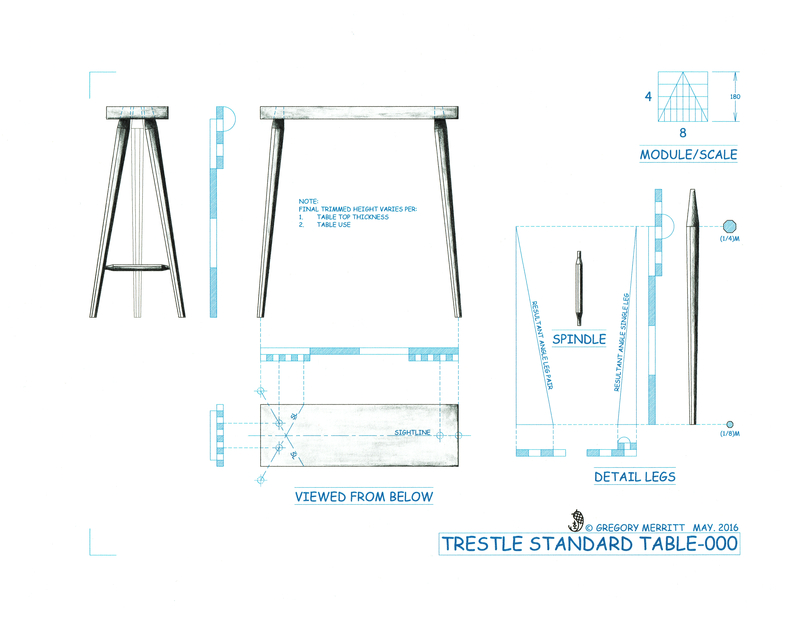 This entry was posted in Illustrating, Table Trestles and tagged Design, octagonal tapered leg, staked furniture, The Anarchist's Design Book. Bookmark the permalink. Awesome project! Believe it or not I have not made a dining table for myself, either, so I know the feeling. 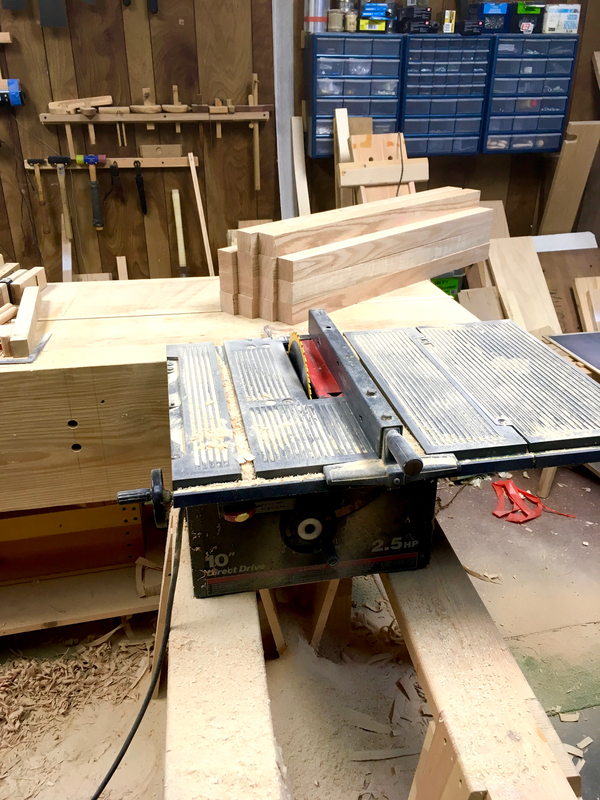 Are you planning any battens for the table top? Thanks Brian. I’m struggling with the top. Thick and beefy would be almost indestructible, but thin is light and easy to move. I’m leaning towards the thinner top and the nailed battens as CW demonstrates in the book. I am biased toward battens, for thick or thin. Nails should work, I would think brass screws would work better, with an enlarged hole. Battens and screws are a good option. I’m surprised at how much I’m struggling with such a simple thing. Its just a wide slab of wood after all! 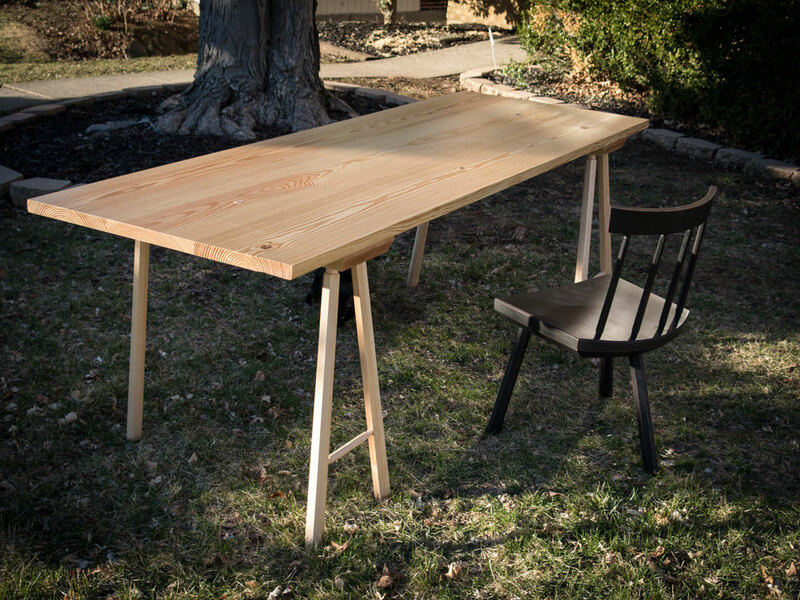 Well it certainly is an upgrade from the old ply, you know this table reminds me of CW’s Roman workbench. I take it this will be knock down table. This is why I don’t want to buy a bigger house. lol! It is keeping me busy. That’s for sure! Are you man or machine? Seriously, you’re putting the rest of us to shame . . . Looking forward to seeing the finished article though.